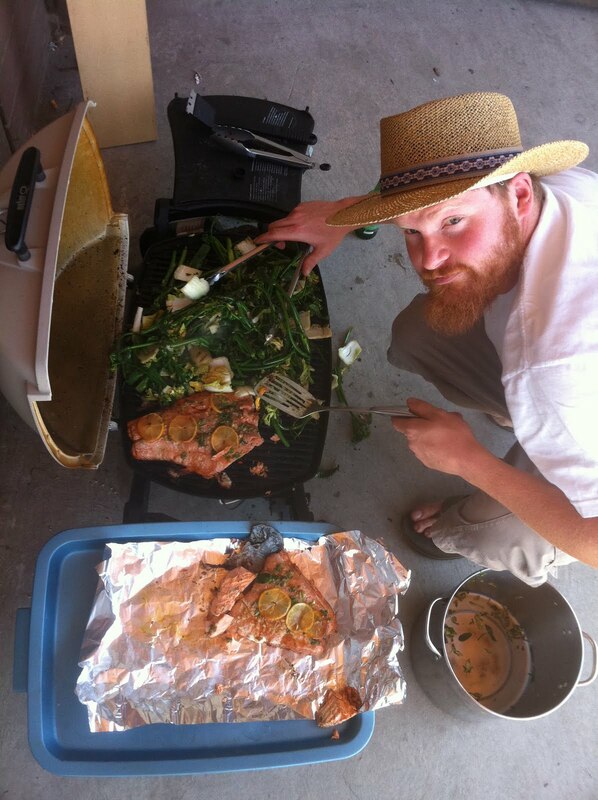 The multi-talented Camil makes a quick switch from farmer to chef, grilling up our veggies with some salmon fillets from our dear friends in Haida Gwaii, Judson, Sev and Gunny! For the veggies, we used gai-lan, wa wa sei cabbage and leeks, generously bathed in sesame oil, canola oil and soy sauce. For the fish, thin lemon slices, teriyaki, fresh parsley, and red russian hard neck garlic (still green, picked at West 15th and Trafalgar yesterday morning - will be in the boxes soon!). Everything straight onto the grill, cooked with love. Thanks Cam, delicious! Haawa Suzuki-Browns!